Use for asphalt shingles. Use for asphalt shingles. Popular for general rough framing and construction. Popular for general rough framing and construction. Use for asphalt shingles. Use for asphalt shingles. Popular for general rough framing and construction. Pro-Fit Sinker Nail, Interior, Pro-Fit, 4D, 7/64 in Shank Diameter, 1-3/8 in Length, 13/64 in Head, 14 ga, Smooth Shank, Vinyl Coated, For General Framing, Coated to Increase Holding Power Used for scaffolding, foundation, column and other concrete forms and temporary lumber construction. Easy to pull. Saves time and lumber. Used for scaffolding, foundation, column and other concrete forms and temporary lumber construction. Easy to pull. Saves time and lumber. Used for scaffolding, foundation, column and other concrete forms and temporary lumber construction. Easy to pull. Saves time and lumber. Popular for general rough framing and construction. Used for nailing drywall to wood. 9 Gauge 1/4" Head. Use to fasten wire and fencing to wood posts. Used for nailing drywall to wood. Used for nailing drywall to wood. 9 Gauge 1/4" Head. Use to fasten wire and fencing to wood posts. For the installation of wire fencing to wooden posts. Galvanized for corrosion resistance. Pro-Fit Box Nail, Interior, Pro-Fit, 4D, 7/64 in Shank Diameter, 1-1/2 in Length, 7/32 in Head, 14 ga, Smooth Shank, Steel, Bright, Used in Easy Driving and Less Splitting is Desired Pro-Fit Box Nail, Interior, Pro-Fit, 3D, 0.083 in Shank Diameter, 1-1/4 in Length, 7/32 in Head, 14-1/2 ga, Smooth Shank, Steel, Bright, Used in Easy Driving and Less Splitting is Desired 6 gauge. Use to fasten stockade panels to wood posts. Popular for general rough framing and construction. 9 Gauge 1/4" Head. Use to fasten wire and fencing to wood posts. For applying wood and hardboard siding to wood structures. Used for nailing drywall to wood. Used for scaffolding, foundation, column and other concrete forms and temporary lumber construction. Easy to pull. Saves time and lumber. Used for nailing drywall to wood. 9 Gauge 1/4" Head. Use to fasten wire and fencing to wood posts. 9 Gauge 1/4" Head. Use to fasten wire and fencing to wood posts. Popular for general rough framing and construction. 9 Gauge 1/4" Head. Use to fasten wire and fencing to wood posts. Popular for general rough framing and construction. Used for nailing drywall to wood. Popular for general rough framing and construction. Popular for general rough framing and construction. 9 Gauge 1/4" Head. Use to fasten wire and fencing to wood posts. Used to attach poultry netting to wood. 13 Gauge. 3/16" head. Structurally rated. For use with MiTek/USP Lumber Connectors' products. Hot-dipped galvanized finish for improved corrosion resistance. For additional information including withdrawal load and allowable shear per nail, please see USP Lumber Connectors charts in the Orgill paper catalog R7 reference pages. Structurally rated. For use with MiTek/USP Lumber Connectors' products. Hot-dipped galvanized finish for improved corrosion resistance. For additional information including withdrawal load and allowable shear per nail, please see USP Lumber Connectors charts in the Orgill paper catalog R7 reference pages. Pro-Fit Finish Nail, 3D, 1-1/4 in Length, 15-1/2 ga, Smooth Shank, Steel, Electro-Galvanized, Used to Interior Trim and Moldings Pro-Fit Finish Nail, 4D, 1-1/2 in Length, 7/64 in Head, 15 ga, Smooth Shank, Steel, Electro-Galvanized, Used to Interior Trim and Moldings Popular for general rough framing and construction. Use around door and window trim, decks. Use for asphalt shingles. Use for asphalt shingles. Use around door and window trim, decks. Use for asphalt shingles. Use around door and window trim, decks. Pro-Fit Box Nail, Exterior, Pro-Fit, 5D, 7/64 in Shank Diameter, 1-3/4 in Length, 7/32 in Head, 14 ga, Smooth Shank, Steel, ASTM A153 MaterialSpecification, Hot Dip Galvanized, Used in Easy Driving and Less Splitting is Desired Use for asphalt shingles. Flexible round head conforms to surface making it difficult for water to get under the cap. Can be used for roofing felt, sheathing, polyethylene, roll roofing, re-roofing, chicken wire, wire lathe. Flexible round head conforms to surface making it difficult for water to get under the cap. Can be used for roofing felt, sheathing, polyethylene, roll roofing, re-roofing, chicken wire, wire lathe. Use for metal hangers to wood. Hot dip galvanized for exterior use. Meets ASTM A-153. For applying wood and hardboard siding to wood structures. Use for metal hangers to wood. Hot dip galvanized for exterior use. Meets ASTM A-153. Pro-Fit Box Nail, Exterior, Pro-Fit, 3D, 0.083 in Shank Diameter, 1-1/4 in Length, 7/32 in Head, 14-1/2 ga, Smooth Shank, Steel, ASTM A153 MaterialSpecification, Hot Dip Galvanized, Used in Easy Driving and Less Splitting is Desired Hardened steel with blunt point and tapered shank cause minimal spalling during penetration and offers even greater pull-out resistance than wire masonry nails. Ideal for attaching wood members to cinder block walls as well as to fresh concrete. Temper hardened steel. Used for nailing lumber to concrete and masonry. Popular for general rough framing and construction. Temper hardened steel. Used for nailing lumber to concrete and masonry. Use for exterior deck and railing. Meets ASTMA-153. Hardened steel with blunt point and tapered shank cause minimal spalling during penetration and offers even greater pull-out resistance than wire masonry nails. Ideal for attaching wood members to cinder block walls as well as to fresh concrete. Temper hardened steel. Used for nailing lumber to concrete and masonry. Use for exterior deck and railing. Meets ASTMA-153. Popular for general rough framing and construction. Temper hardened steel. Used for nailing lumber to concrete and masonry. Use for exterior deck and railing. Meets ASTMA-153. Temper hardened steel. Used for nailing lumber to concrete and masonry. Hardened steel with blunt point and tapered shank cause minimal spalling during penetration and offers even greater pull-out resistance than wire masonry nails. Ideal for attaching wood members to cinder block walls as well as to fresh concrete. Used for scaffolding, foundation, column and other concrete forms and temporary lumber construction. Easy to pull. Saves time and lumber. Popular for general rough framing and construction. Popular for general rough framing and construction. Used for scaffolding, foundation, column and other concrete forms and temporary lumber construction. Easy to pull. Saves time and lumber. Annular ring threads provide secure attachment of cedar, redwood and other stable decking materials to deck joists and preclude nail head popping. Slender shanks permit nailing at board ends without splitting. Small unobtrusive checker pattern heads blend with wood grain and diffract sunlight. NOTE: Choose 316 Stainless Steel for seaside applications and superior corrosion resistance. Highest quality nails for cedar, redwood and cypress siding materials. High tensile Nickel/Chromium stainless steel will last the life of wood siding without degradation ever. Slender gauge and blunt diamond point minimize splitting. Generous under-head fillet allows nails to be driven flush or countersunk without crushing surrounding wood. Checker pattern head blends with wood texture and serves to diffract sunlight. Annular ring threads preclude cupping of siding boards and nail-head popping. NOTE: Use 316 Stainless steel for seaside applications and superior corrosion resistance. Highest quality nails for cedar, redwood and cypress siding materials. High tensile Nickel/Chromium stainless steel will last the life of wood siding without degradation ever. Slender gauge and blunt diamond point minimize splitting. Generous under-head fillet allows nails to be driven flush or countersunk without crushing surrounding wood. Checker pattern head blends with wood texture and serves to diffract sunlight. Annular ring threads preclude cupping of siding boards and nail-head popping. NOTE: Use 316 Stainless steel for seaside applications and superior corrosion resistance. Annular ring threads provide secure attachment of cedar, redwood and other stable decking materials to deck joists and preclude nail head popping. Slender shanks permit nailing at board ends without splitting. Small unobtrusive checker pattern heads blend with wood grain and diffract sunlight. NOTE: Choose 316 Stainless Steel for seaside applications and superior corrosion resistance. Highest quality nails for cedar, redwood and cypress siding materials. High tensile Nickel/Chromium stainless steel will last the life of wood siding without degradation ever. Slender gauge and blunt diamond point minimize splitting. Generous under-head fillet allows nails to be driven flush or countersunk without crushing surrounding wood. Checker pattern head blends with wood texture and serves to diffract sunlight. Annular ring threads preclude cupping of siding boards and nail-head popping. NOTE: Use 316 Stainless steel for seaside applications and superior corrosion resistance. National Hardware Trim Nail, Series: V7727, 7/8 in, Steel, Brass, For Indoor/Outdoor Applications Highest quality nails for cedar, redwood and cypress siding materials. High tensile Nickel/Chromium stainless steel will last the life of wood siding without degradation ever. Slender gauge and blunt diamond point minimize splitting. Generous under-head fillet allows nails to be driven flush or countersunk without crushing surrounding wood. Checker pattern head blends with wood texture and serves to diffract sunlight. Annular ring threads preclude cupping of siding boards and nail-head popping. NOTE: Use 316 Stainless steel for seaside applications and superior corrosion resistance. Annular ring threads provide secure attachment of cedar, redwood and other stable decking materials to deck joists and preclude nail head popping. Slender shanks permit nailing at board ends without splitting. Small unobtrusive checker pattern heads blend with wood grain and diffract sunlight. NOTE: Choose 316 Stainless Steel for seaside applications and superior corrosion resistance. Highest quality nails for cedar, redwood and cypress siding materials. High tensile Nickel/Chromium stainless steel will last the life of wood siding without degradation ever. Slender gauge and blunt diamond point minimize splitting. Generous under-head fillet allows nails to be driven flush or countersunk without crushing surrounding wood. Checker pattern head blends with wood texture and serves to diffract sunlight. Annular ring threads preclude cupping of siding boards and nail-head popping. NOTE: Use 316 Stainless steel for seaside applications and superior corrosion resistance. 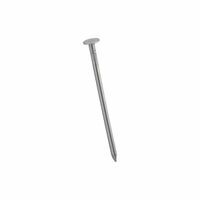 Pro-Fit Sinker Nail, 4D, 1-3/8 in Length, 13/64 in Head, 14 ga, Vinyl Coated, For General Framing, Coated to Increase Holding Power Popular for general rough framing and construction. Used to install barbed wire and field fence. Made from .101" wire, with 3/16" flat heads. Nails have "BULLSEYE" heads to help hold paint. MADE IN USA Used to install barbed wire and field fence. 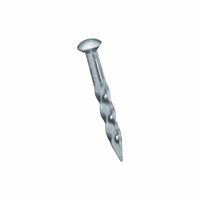 Pro-Fit Common Nail, Interior, Pro-Fit, 10 in Length, Spike Head, 3/8 in Head, 3/4 in, Smooth Shank, Steel, Bright, For General Rough Framing and Construction Pro-Fit Common Nail, Interior, Pro-Fit, 12 in Length, Spike Head, 3/8 in Head, 3/4 in, Smooth Shank, Steel, Bright, For General Rough Framing and Construction Popular for general rough framing and construction. Pro-Fit Box Nail, 16D, 3-1/2 in Length, 11/32 in Head, 10 ga, Smooth Shank, Cement Coated, Use where Easy Driving and Less Splitting is Desired, Framing Used for nailing drywall to wood. 9 Gauge 1/4" Head. Use to fasten wire and fencing to wood posts. 9 Gauge 1/4" Head. Use to fasten wire and fencing to wood posts. Temper hardened steel. Used for nailing lumber to concrete and masonry. Temper hardened steel. Used for nailing lumber to concrete and masonry. Temper hardened steel. Used for nailing lumber to concrete and masonry. Temper hardened steel. Used for nailing lumber to concrete and masonry. 9 Gauge 1/4" Head. Use to fasten wire and fencing to wood posts. 9 Gauge 1/4" Head. Use to fasten wire and fencing to wood posts. Used to attach poultry netting to wood. 13 Gauge. 3/16" head. Popular for general rough framing and construction. Popular for general rough framing and construction. Used for nailing drywall to wood. Use for asphalt shingles. Use for asphalt shingles. 9 Gauge 1/4" Head. Use to fasten wire and fencing to wood posts. Used for nailing drywall to wood. Pro-Fit Common Log Spike, 10 in Length, 9/16 in Head, Spiral Shank, For Landscaping, Log Cabin Construction and Framing Use around door and window trim, decks. Use around door and window trim, decks. Hardened steel with blunt point and tapered shank cause minimal spalling during penetration and offers even greater pull-out resistance than wire masonry nails. Ideal for attaching wood members to cinder block walls as well as to fresh concrete. Hardened steel with blunt point and tapered shank cause minimal spalling during penetration and offers even greater pull-out resistance than wire masonry nails. Ideal for attaching wood members to cinder block walls as well as to fresh concrete. Use for metal hangers to wood. Hot dip galvanized for exterior use. Meets ASTM A-153. Use for metal hangers to wood. Hot dip galvanized for exterior use. Meets ASTM A-153. Used to install barbed wire and field fence. Locks easily to post. Manufactured of high tension steel wire and galvanized with a triple coating of zinc; class 3. Meets FF-N-105B. Highest quality nails for cedar, redwood and cypress siding materials. High tensile Nickel/Chromium stainless steel will last the life of wood siding without degradation ever. Slender gauge and blunt diamond point minimize splitting. Generous under-head fillet allows nails to be driven flush or countersunk without crushing surrounding wood. Checker pattern head blends with wood texture and serves to diffract sunlight. Annular ring threads preclude cupping of siding boards and nail-head popping. NOTE: Use 316 Stainless steel for seaside applications and superior corrosion resistance. Pro-Fit Underlayment Nail, 2 in Length, 17/64 in Head, 12 ga, Ring Shank Highest quality nails for cedar, redwood and cypress siding materials. High tensile Nickel/Chromium stainless steel will last the life of wood siding without degradation ever. Slender gauge and blunt diamond point minimize splitting. Generous under-head fillet allows nails to be driven flush or countersunk without crushing surrounding wood. Checker pattern head blends with wood texture and serves to diffract sunlight. Annular ring threads preclude cupping of siding boards and nail-head popping. NOTE: Use 316 Stainless steel for seaside applications and superior corrosion resistance. Made from premium 8g Bezinal coated wire, these barbed fence staples feature double barbs to maintain fastening and provide easy driving. Use for exterior deck and railing. Meets ASTMA-153. Popular for general rough framing and construction. Use for exterior deck and railing. Meets ASTMA-153. Pro-Fit Underlayment Nail, 1-1/4 in Length, 13/64 in Head, 14 ga, Ring Shank Annular ring threads provide secure attachment of cedar, redwood and other stable decking materials to deck joists and preclude nail head popping. Slender shanks permit nailing at board ends without splitting. Small unobtrusive checker pattern heads blend with wood grain and diffract sunlight. NOTE: Choose 316 Stainless Steel for seaside applications and superior corrosion resistance. Popular for general rough framing and construction. For applying wood and hardboard siding to wood structures. For applying wood and hardboard siding to wood structures. Use for corrugated steel roofing and siding. Pro-Fit Pole Barn Nail, Heat Treated, 5 in Length, 3/8 in Head, 7 ga, Ring Shank, Steel, ASTM A153, Galvanized, Used in Pole Building Construction Pro-Fit Pole Barn Nail, Heat Treated, 6 in Length, 3/8 in Head, 7 ga, Ring Shank, Steel, ASTM A153, Galvanized, Used in Pole Building Construction Highest quality nails for cedar, redwood and cypress siding materials. High tensile Nickel/Chromium stainless steel will last the life of wood siding without degradation ever. Slender gauge and blunt diamond point minimize splitting. Generous under-head fillet allows nails to be driven flush or countersunk without crushing surrounding wood. Checker pattern head blends with wood texture and serves to diffract sunlight. Annular ring threads preclude cupping of siding boards and nail-head popping. NOTE: Use 316 Stainless steel for seaside applications and superior corrosion resistance. Annular ring threads provide secure attachment of cedar, redwood and other stable decking materials to deck joists and preclude nail head popping. Slender shanks permit nailing at board ends without splitting. Small unobtrusive checker pattern heads blend with wood grain and diffract sunlight. NOTE: Choose 316 Stainless Steel for seaside applications and superior corrosion resistance. Annular ring threads provide secure attachment of cedar, redwood and other stable decking materials to deck joists and preclude nail head popping. Slender shanks permit nailing at board ends without splitting. Small unobtrusive checker pattern heads blend with wood grain and diffract sunlight. NOTE: Choose 316 Stainless Steel for seaside applications and superior corrosion resistance. Highest quality nails for cedar, redwood and cypress siding materials. High tensile Nickel/Chromium stainless steel will last the life of wood siding without degradation ever. Slender gauge and blunt diamond point minimize splitting. Generous under-head fillet allows nails to be driven flush or countersunk without crushing surrounding wood. Checker pattern head blends with wood texture and serves to diffract sunlight. Annular ring threads preclude cupping of siding boards and nail-head popping. NOTE: Use 316 Stainless steel for seaside applications and superior corrosion resistance. Highest quality nails for cedar, redwood and cypress siding materials. High tensile Nickel/Chromium stainless steel will last the life of wood siding without degradation ever. Slender gauge and blunt diamond point minimize splitting. Generous under-head fillet allows nails to be driven flush or countersunk without crushing surrounding wood. Checker pattern head blends with wood texture and serves to diffract sunlight. Annular ring threads preclude cupping of siding boards and nail-head popping. NOTE: Use 316 Stainless steel for seaside applications and superior corrosion resistance. Annular ring threads provide secure attachment of cedar, redwood and other stable decking materials to deck joists and preclude nail head popping. Slender shanks permit nailing at board ends without splitting. Small unobtrusive checker pattern heads blend with wood grain and diffract sunlight. NOTE: Choose 316 Stainless Steel for seaside applications and superior corrosion resistance. Annular ring threads provide secure attachment of cedar, redwood and other stable decking materials to deck joists and preclude nail head popping. Slender shanks permit nailing at board ends without splitting. Small unobtrusive checker pattern heads blend with wood grain and diffract sunlight. NOTE: Choose 316 Stainless Steel for seaside applications and superior corrosion resistance. Highest quality nails for cedar, redwood and cypress siding materials. High tensile Nickel/Chromium stainless steel will last the life of wood siding without degradation ever. Slender gauge and blunt diamond point minimize splitting. Generous under-head fillet allows nails to be driven flush or countersunk without crushing surrounding wood. Checker pattern head blends with wood texture and serves to diffract sunlight. Annular ring threads preclude cupping of siding boards and nail-head popping. NOTE: Use 316 Stainless steel for seaside applications and superior corrosion resistance. Annular ring threads provide secure attachment of cedar, redwood and other stable decking materials to deck joists and preclude nail head popping. Slender shanks permit nailing at board ends without splitting. Small unobtrusive checker pattern heads blend with wood grain and diffract sunlight. NOTE: Choose 316 Stainless Steel for seaside applications and superior corrosion resistance. For installation of joist hangers, structural connectors, and hurricane clips in corrosive environments. Applications: Joists Hangers, Structural Connectors, etc. National Nail Roofing Nail, 1-3/4 in Length, Lead Head, Barbed Shank, Steel, Bright Checkered head stiff, slender nails reduce splitting, resist rust and hold shingles in place. Double dipped in molten zinc.